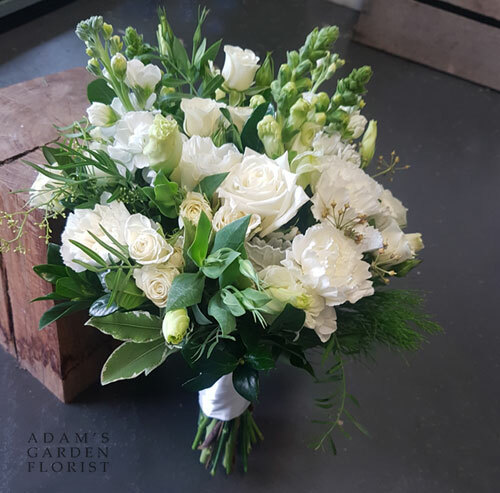 One of our favourite styles for wedding flowers is the classic mixed white seasonal blooms, complimented with differently textured greenery. This is an example of an informal, almost hand-picked-look posy, from a May wedding. We have used standard and mini roses, carnations, stock, lisianthus and snapdragons. To see more of our wedding work, check out out instagram, our portfolio, or come in to see us (but do call first just in case we’re busy). Also, check out our wedding page for more info.